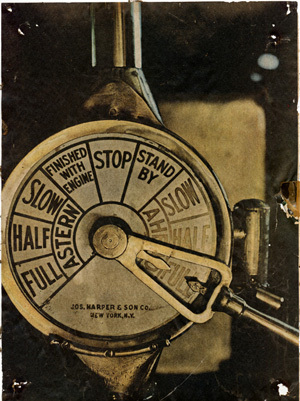 The engine order telegraph is used to communicate orders from the Combat Information Center (CIC) to the Main Machinery Spaces. #1 Main Electric Pump ON filtering the pool through Valve #8. #1 Main Electric Pump ON, Valve #8 closed. Main Battle Pump ON idling by special order from CIC. AHEAD FULL -- Attack Pressure (80). STOP -- Stop all pumps, remain at station awaiting further orders. STAND BY -- Prepare for Battle. Set the Battle Lights. ASTERN FULL-- Start Air Compressor, maintain air pressure (60). ASTERN HALF -- Communicate by CIC communicator or Battle Phone. ASTERN FULL -- Start Spring Well Pump into Main Ammunition Bunker. Active Defense, Disable Enemy Com Lines. Central Emergency, Man Battle Stations, Set Battle Lights. CONDITION 4 (Gasp) Grab Wine and Run!